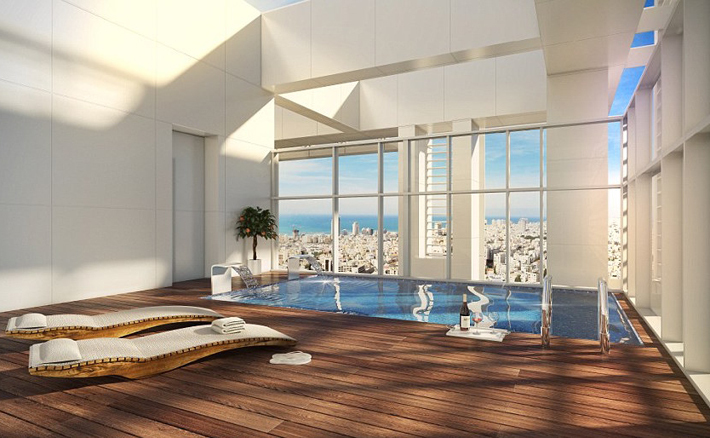 Madonna is reportedly in talks to purchase a penthouse in the fancy 42-story Meier-on-Rothschild building in Tel Aviv, Israel, which Forbes recently named as one of the world's tallest luxury residential towers. The image above (and the ones in the gallery below) are merely computer-generated renderings, but it still looks stunning. Madonna was seen with a brochure for the place back in 2013, and the Daily Mail reports that the pop superstar is eying is the $55 million penthouse at the top of the building, aptly named Palace in the Sky. The 15,263-square-foot pad has a private elevator, double-height 22-foot ceilings, a private gym, a bar, a cinema and a mini-spa. The building has 141 apartments and penthouses with private terraces, and one of the other units, the $23 million Rothschild Summit Penthouse, seems like it could be an awesome option for Madge as well. The 6,520-square-foot unit also includes a private elevator, a deck with a private plunge pool and five luxurious bedroom suites with walk-in dressing rooms and bathrooms. As far as building amenities, there is a 24-hour concierge, a spa, a gym, a 25-meter Olympic pool, a relaxation lounge, a cocktail bar, a wine cellar and there are even retail stores. It's been reported that Natalie Portman is also reportedly considering buying a unit in this building.